Depending on a website's design, color scheme, choice of fonts and page elements displayed on it, reading text can either be a distraction-free experience, or rather distracting. If you ever read a text while a blinking flash advertisement was displayed on the same page at the same time, you know that this can be quite distracting. While there are ways to deal with those annoyances, using an ad-blocker for example or disabling Flash and other plugins to reduce the chance of that happening, there are other ways to deal with those issues. So called readability extensions improve how the page is displayed to you. You find several listed on our best Chrome and best Firefox extension lists. All have in common that you have to invoke the functionality of the extension or userscript, usually by clicking on a button. They modify the design of the page, so that you end up with a basic version of it that concentrates only on the title, text, and in-text images. Text Mode is somewhat different from those extensions. While it does modify web pages visually that you run it on, it keeps the overall layout untouched. 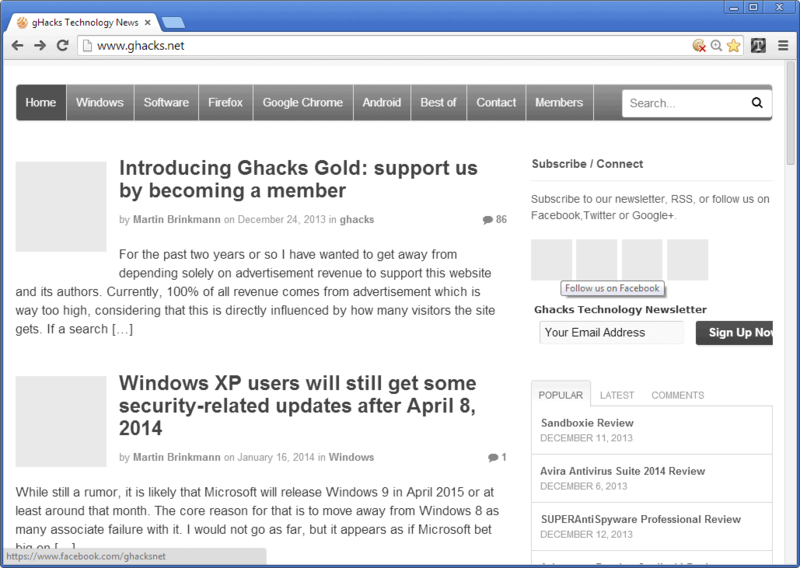 As you can see on the screenshot above, the layout of Ghack's frontpage is still there. The only elements missing are images, animated contents, videos, and other elements such as social media icons. What you will also notice is that the color scheme is now grayscale. While that does not make such a big difference on a site like Ghacks, it may improve readability on colorful websites. This works well on most websites, and once enabled, you can use it in any tab of the browser without having to enable the feature again. You can turn the text only mode off again at any time with another click on the extension icon. There are sites where the extension does not work correctly, or will make modifications so that the underlying site becomes less usable. This is for instance the case on image-heavy websites where images make up the main content, or are needed to understand the content, or on some sites where the text font color did not play well with the background color. As far as options go, you have three that you can customize. First, you can replace the default image replacement with different designs. If you prefer striped designs instead of solid color ones, you can make that modification here. The second option enables you to disable the changing of the background color to white. This in fact resolved some of the display issues that I had while using Text Mode in its default mode of operation. The third and final option turns of color desaturation, so that text colors remain the way they are. This can be quite useful if you prefer links or titles to be highlighted in different colors. Text Mode is an interesting extension for Google Chrome that offers a different set of modifications than most other readability extensions. It is quite unobtrusive and works fine on most websites that you will encounter while having it turned on. I have bookmarklets I made that do these things and work in all browsers except IE.